Air conditioning, elevator, microwave, washing machine, hair dryer, telephone (on request), high speed internet access, cable/satellite television, walk to shops, can manage w/o car, private terrace. -Priced for parties of 4. Reductions for smaller parties, higher for more. Inquire. Dining room with hall to the bedrooms and bathrooms. Twin bedroom(can be made as one bed). One of the streets nearby. This elegant little building is owned by a local family and has been converted into 11 pleasant, bright and comfortable apartments. The location is terrific. It is on a pedestrian-only street in the historic center near the Picasso Museum and the Santa Maria del Mar church. The lively Ramblas, the world-famous tree-lined broad avenue with cafes, tapas bars, and street performers is just a leisurely 10-minute walk away. On the Ramblas you'll find the daily food and fish market which is definitely worth a visit even if you don't want to cook. There is an excellent selection of restaurants and shops near the building. And it is just 150 meters from the sea! This high-quality apartment is on the fifth floor with elevator. It is bright, clean, comfortable and a real haven to return to after a day exploring vibrant Barcelona. There is a open living room/dining room and well equipped separate kitchen. There are 3 bedrooms: two twin(can be put together) bedrooms and one single, all spacious. There are two bathrooms, one with bathtub, shower over, sink and toilet. The other with shower stall, sink and toilet. 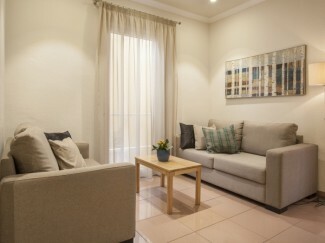 The apartment is air conditioned, making this a very comfortable accommodation even in summer. "Great! We loved Barcelona and our location. The people in the office were accommodating. Great location in the heart of the El Born area. Very walkable location near lots of restaurants, etc. Nice to have 3 bedrooms and 2 bathrooms off the living room. "